To Make the Chocolate Cookie Crust: Preheat the oven to 300 degrees F. Lightly spray a 9-inch springform pan with nonstick cooking spray. Line the pan with parchment paper and lightly spray the parchment and sides of the pan. In a food processor, grind the cookies to a very fine crumb. You should have about 3½ cups. Put the crumbs in a small bowl. Pour the melted butter over them and mix with a rubber spatula until well combined. Turn the crumb mixture into the prepared pan and press it into the bottom and up the sides, leaving about ½ inch between the top of the crust and the top of the pan. Use the back of a large spoon to get an even layer of crust. Place the pan in the freezer and let the crust set for about 10 minutes. Bake the crust in the oven until it is dry to the touch, about 10 minutes. Transfer the pan to a wire rack and let cool. 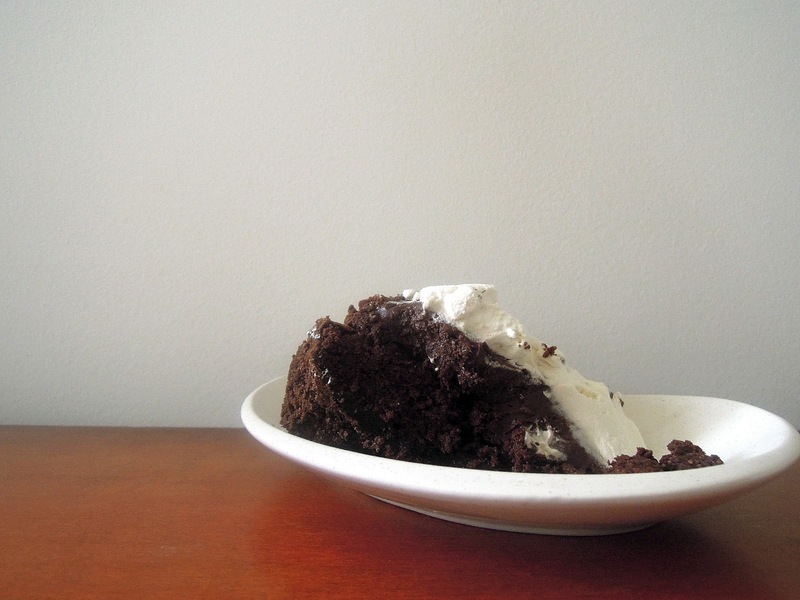 To Make the Flourless Chocolate Cake: Increase the oven temperature to 350 degrees F. Using a double boiler or microwave, melt the butter and chocolate together. Set aside to cool. In a small bowl, whisk together the espresso powder, coffee, salt, and vanilla. Set aside. In the bowl of a standing mixer fitted with the whisk attachment, beat the egg yolks with ½ cup of the sugar until the mixture is light and has almost doubled in volume, about 5 minutes. Add the chocolate mixture and beat until just combined. Scrape down the sides and bottom of the bowl and mix on low speed for 5 seconds. Add the coffee mixture and beat until just combined. Scrape down the sides and bottom of the bowl and mix on low for 5 seconds. In a clean bowl fitted with the whisk attachment (or you can elect to do this step by hand if you are feeling strong), beat the egg whites until foamy. Gradually increase the speed to high and add the remaining ½ cup sugar, beating until soft peaks form. Scoop 1 cup of the egg whites into the chocolate mixture. Use a rubber spatula to gently fold in the egg whites. After about 30 seconds of folding, add the remaining egg whites and continue folding until they are almost completely combined. Do not rush the folding process, work gently, and take care not to overmix. Pour the batter onto the cooled cookie crust and bake for 38 to 42 minutes, until the cake is set but still jiggles slightly. It might not appear to be completely cooked. Transfer it to a wire rack and cool completely. (As it cools, the cake will deflate in the center and look sunken. Do not despair, this is just the way it settles.) Tightly wrap and refrigerate the cake for at least three hours or overnight. To Make the Chocolate Pudding: In a medium saucepan, whisk together the sugar, cocoa powder, cornstarch, and salt. Add the egg yolks and whisk until combined. The mixture will look like a thick paste. Slowly pour in the milk, whisking constantly. In a saucepan over medium heat, bring the mixture to a boil, whisking constantly to prevent it from burning on the bottom of the pan. Boil for 30 seconds, then transfer it to a medium bowl. Add the butter, vanilla, and chocolate and whisk until combined. Continue to whisk for a few more minutes to cool the mixture slightly. Let the pudding stand for 15 minutes at room temperature. Press a piece of plastic wrap directly onto the surface of the pudding to prevent a skin from forming, and chill it for at least 3 hours. 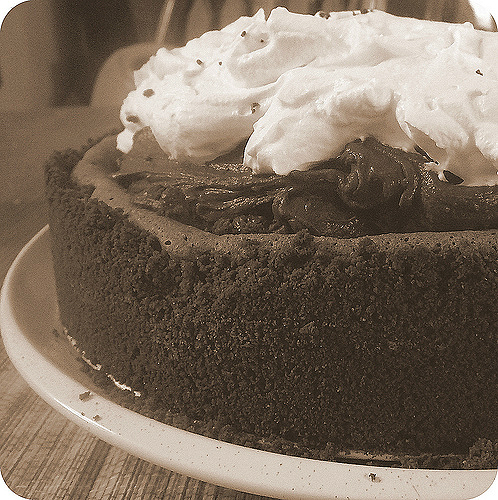 To Assemble the Mississippi Mud Pie: Stir the pudding to loosen it, then pour it on top of the cake, making sure to stay inside the cookie-crust border. Use an offset spatula to spread the pudding into an even layer. Return the cake to the refrigerator for at least 30 minutes while you prepare the whipped cream topping. Spread whipped cream across the pudding layer, all the way out to the sides, unmold the cake, and serve it immediately. The cake can be kept, covered, in the refrigerator for up to 2 days. Notes: This is an easy, though-many-stepped, recipe. Don’t fear, just break up the parts over the course of two days. Make the cookie crust and cake on day one, and make the pudding on the day you’re going to serve the dessert. Keep in mind that the cake requires 3 hours to set before it can be cut. The whipped cream topping can be made 15 minutes before serving. I have tried to do this pudding. The base was easy, the cake section was simple to follow but I'm having an issue with the chocolate pudding section, it seems too runny even after chilling for 4 hours. Any suggestions? Thanks Erin it worked perfectly and tasted even better.